Kai Davis, a slam poet from Philadelphia, captivates me with her poetry every time and tackles a wide range of issues such as racism, homophobia and sexism. 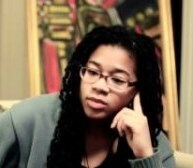 As a young poet she brings all the -isms which affect her (racism, sexism, classism, etc.) into her poetry. It is through her performances that she is able to use her personal experiences to comment on the white, patriarchal, hetero-normative society we live in. Kai Davis, and slam poets in general, use words and the performance of these words to literally sucker punch the audience.